Rome is one of the most fascinating cities in the world, attracting more than 4 million visitors a year, rain or shine. 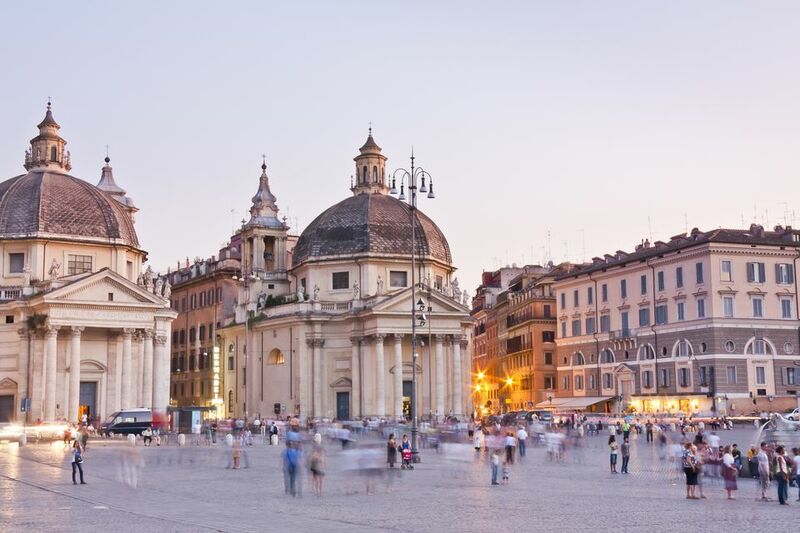 Located in the center of the country with outlying areas skirting the Tyrrhenian Sea, Rome enjoys a sunny, Mediterranean climate. Average annual temperatures hover somewhere between 68 degrees F (20 degrees C) during the day and about 50 degrees F (10 degrees C) at night. This mild weather makes it the ideal year-round travel destination. Summers in the Eternal City can be quite hot and humid, especially in July and August, while winters tend to be chilly and wet. Fall and spring offer bright, toasty days and cool nights. June, July, and August are perfect for those who like the heat and high humidity (between a muggy 72 to 75 percent). It's the ideal time for dining al fresco in outdoor cafes or strolling along the Tiber River on balmy evenings. Be prepared for the mercury to climb in the daytime to around 90 degrees F (32 degrees C), and often higher. Rain is unlikely but possible, and it's a welcome to relief to cool things off, at least momentarily. What to Pack: Bring T-shirts, shorts, sundresses, and sandals. Beat the heat inside churches, but do keep in mind that most require modest dress to enter, so pack a light sweater in your backpack to cover your bare shoulders or a long dress or lightweight pants to cover your legs. Note that in Rome's heavily paved, mostly treeless city center, midday temperatures can climb much higher. While even the most budget hotels have air-conditioning, as little as 10 years ago, this was not always the norm. In the summertime, it's a must in Rome so if in doubt, confirm with your accommodation that it's available. Autumn is one of the best times to be in Rome. The golden Roman sun is at its most beautiful and temperatures rarely dip below 44 degrees F (7 degrees C). September and October are typically dry, boasting warm days and nippy nights. November cools down slightly but is still quite mild with rain showers expected, off and on. What to Pack: Long sleeve T-shirts, cotton sweaters and long pants will suffice for most of the season. Bring a heavier sweatshirt or jacket for the evenings and a lightweight rain poncho, especially towards the end of fall. December, January, and February are the coldest months, with average temps ranging between 50 and 59 degrees F (10 and 15 C) in the daytime and 37 and 41 degrees F (3 and 5 degrees C) at night. Light snowfall is possible, though rare (if snow does happen to accumulate, it usually melts within a day or two). Even in the dead of winter, you can expect a mix of deep blue skies and overcast, gray ones. What to Pack: A heavy coat, gloves, a scarf, and a hat will keep you sufficiently comfortable. Rain gear is highly recommended. It's normal to experience cold snaps or warm spells during the winter, so be sure to layer clothing to prepare for all possibilities. March can be on the chilly side, but it begins to warm up after Easter. Early spring is the most unpredictable, therefore you should anticipate the possibility of rain, particularly in April. Evenings usually require a light jacket and scarf. What to Pack: Bring an umbrella and a medium-weight jacket with a hood, long-sleeve shirts, heavy cotton trousers, and a light scarf. A waterproof jacket is a good idea, too. As with most seasons in Rome, layering is the name of the game. The Weather and Climate in Washington, D.C.